With all the stresses of everyday life, it is very important for people to unwind every once in a while. In fact, as the toxicity of everyday living seems to grow, it is actually advisable to find a way to release even more. The problem is, finding a good place or a good way to de-stress is now proven to be a challenge nowadays. Sure you can find a cozy spot. Or what seems like a cozy spot to chill with your family and friends. But after the uncooperative rush hour traffic, it’s probably more likely for you to find yourself even more beat than you’ve been after a long day at work. Wouldn’t it just be nice to hang out among friends on a Friday night? Not needing to think about paying a check, and limiting your alcohol intake? Or making a fool of yourself should you decide to just go crazy and let yourself out? Pretty sure that’s music to your ears – and guess what? It is now made possible for you by the best family owned leisure store in the country. Your home as it sits just need a nitty fix and a few tricks. And it could be the perfect place to unwind and bond with your family and friends with the help of Family Leisure Superstore. Family Leisure, being a family-run business since 1967 has your best interest at heart. Especially in providing affordable state-of-the-art relaxation and leisure solutions for your home. With stores conveniently situated in nine different locations such as Indianapolis, Birmingham, Nashville, San Antonio, Kansas City, Minneapolis, Little Rock, Oklahoma City and Memphis. You’re sure to receive only the best kind of service and support as a customer. Should you find it hard to take time away from your busy schedule, the company still got you covered. As they also have an online store that offers the same kind of unbelievable deals that you would find in their physical stores. The Family Leisure Superstore provides you with impeccable options for relaxation right at the comfort of your home. The business offers a variety of products from the best local and international brands made from the best quality of materials. So what can you find at the best leisure store in United States? Billiards and pool is among the most popular past times all over the world. Wouldn’t it just be nice to have one of your own which you could use to unwind with your friends and family; with a couple of cold ones on the side? 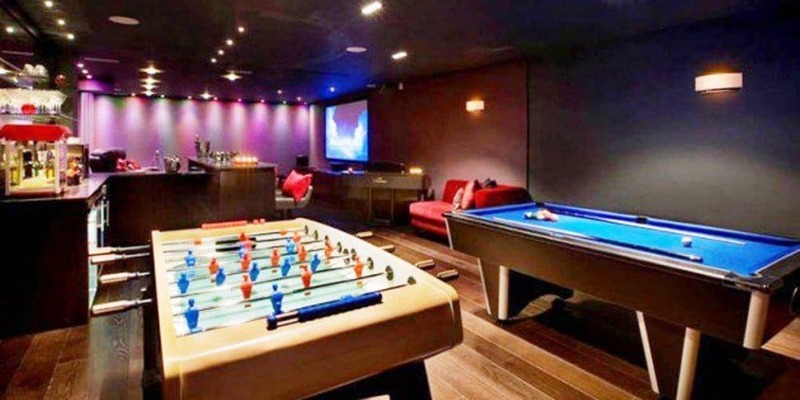 Family Leisure offers the best pool tables, from ones made of metal to the more sophisticated wooden pieces. Should games turn to a more competitive level than expected and you need to find your edge, check out these tips and tricks to help you improve your play. If you love games but billiards or pool just won’t cut it for you, you still came to the right place. Family Leisure offers an array of gaming tables for you to choose from. Should you love to deal or play cards, there are Poker Tables available for the taking. Looking for something more suitable for you and your kids to play with? Sounds like an Air Hockey or Dome Hockey table would just be good for you. Perhaps your family is more of the sports fan? Well, you’re still covered as the store also has Foosball, Ping Pong Tables and Shuffleboards. Not everyone gets excited with the idea of unwinding through games and that’s very much understandable. It might just be that you’re one of those people whose idea of relaxation and unwinding is simply cozying up in a special spot alone or in the company of friends at the comfort of your home. Well, if that’s the case, Family Leisure is still a good fit for you. The company offers the best home improvements for you to build a “Zen zone” of your own starting with above-ground pools, traditional pools, patio furniture and even tanning beds. There’s actually a lot more that the company offers so let’s just say that if you can think it, Family Leisure could make it happen! I’m sure everything you’ve read seems so exciting as it is. But here’s the best part - the cherry on top. Not only do you get the pleasure of having something to take a load off with or somewhere to unwind for a lifetime at an affordable price. Your purchases also come with Free Coast to Coast Delivery via FedEx and free installation as well. Bottom line, if you buy from Family Leisure, each purchase comes with a tag of commitment that you would always be valued as a customer.